ALFA FNK a truly sensational six piece band that performs for Functions, Weddings and special Events across Scotland.Don’t settle for the ordinary or settle for less than the best for your special party! This is a band with a HUGE sound, amazing light show, and a great set list that covers all kinds of music performed by 6 of Scotland’s best musicians. 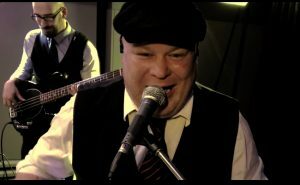 The story began way back in 2004 when band leader Ben Stones formed the hugely popular band Northern Star, the first truly modern sounding and looking act to focus on the wedding market. Fast forward to 2016, with over 1500 weddings and events under his belt, it was time to again to bring a game changing band to the wedding and event market. 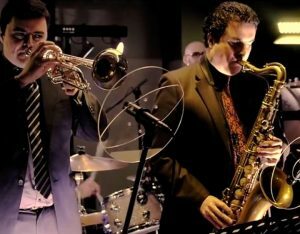 Recruiting the Sellars brothers on horns, shaking up the set list, and adding a huge lighting set up to the show, ALFA FNK looks to bring that BIG SHOW BAND sound and look to the wedding market. After a stellar debut in December 2016, the band is now ready to hit the road, and get those dance floors filled. It’s very easy for bands today to hide behind glossy production. This bands video was recorded 100% LIVE, no studio trickery. Ben believes you should get what you buy. The videos were recorded at the Apex Dundee Christmas part nights and is a very typical type of venue for us to play.